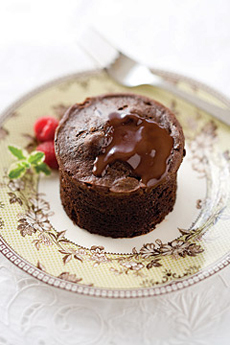 A molten chocolate cake or lava cake from The King’s Cupboard, a NIBBLE Top Pick Of The Week. There are thousands of different types of cakes in the world today; each culture has its specialties, most of which never reach our shores. Here, we present some of the different types of cakes that one is likely to encounter—or at least hear about—in the U.S. If your favorite isn’t represented, tell us about it. After you’ve checked out the cakes, take a look at our other food glossaries—an easy way to get up to speed on more than fifty different food categories. Most related to this Cake Glossary are our Chocolate Glossary, Custard Glossary, Dessert Sauce Glossary, Ice Cream & Frozen Desserts Glossary and Sugar Glossary. This imposing cake consists of tall layers of white cake topped with boiled white icing; the white filling contains chopped nuts and/or candied fruits. The cake is named after a character in a 1906 novel of the same name by Owen Wister. Following the success of the novel, two Baltimore locals opened a Lady Baltimore Tea Room and created the recipe, a variation of a Queen Cake. 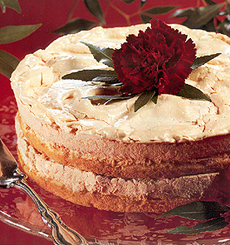 A specialty in the southern U.S., the Lady Baltimore Cake is popular for weddings. Lady Baltimore cake. Photo courtesy TasteOfHome.com. Here’s the recipe. Ladyfingers are very light, sweet sponge cakes. They have more flour, and are thus drier, than other sponges; before baking, powdered sugar is sifted over the top to provide a soft crust, and also a lighter cast to the final baked product. 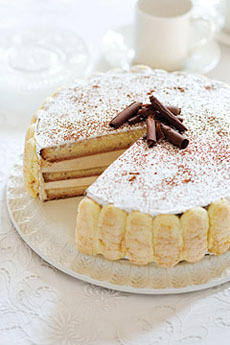 Although no lady has such a fat, flat finger, they are three to four inches long and most popularly used as the cake component in charlottes, tiramisu and trifles, where they acquire moisture from the custard, cream or other components (they are soaked in coffee liqueur for tiramisu). Ladyfingers originated in the late 15th century at the court of the Duchy of Savoy, to celebrate a visit of the King of France. They were given the name savoiardi. (The House of Savoy, which began in northern Italy, eventually ruled the entire kingdom until the end of World War II.) See a photo of ladyfingers in the charlotte. A cake bordered with ladyfingers. Photo courtesy MackenzieLtd.com. A dessert of Australian origin, sometimes called the national cake of Australia. Most people believe it was named after Lord Lamington, who served as Governor of Queensland from 1896 to 1901; although it could be named for his wife, or for something else entirely. It consists of squares of sponge cake coated in chocolate sauce and desiccated coconut. They can be single squares or layers with filling—whipped cream or jam. July 21st is National Lamington Day. A cake consisting of two or more layers, held together by frosting, jam, whipped cream or other filling. 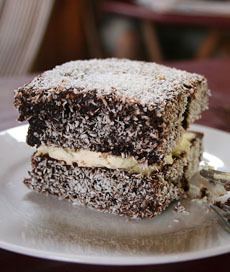 Lamington: filled sponge layers topped with chocolate sauce and desiccated coconut. Photo by Monica Shaw | Wikimedia. Before chemical leavening agents (baking soda, baking powder) and commercial yeast, wild yeast was used to raise bread and cake. (wild means dependent on nature). By the 1840s, chemical leavenings such as pearl ash (potassium carbonate) and saleratus (potassium bicarbonate) were generally available to American cooks. In 1843, British chemist Alfred Bird invented baking powder (sodium bicarbonate). Modern commercial yeast was not available until the late 1800s, and the granulated active dry yeast we use today was invented by the Fleischmann brothers of Cincinnati, who introduced it at the Philadelphia Centennial Exposition in 1876. The difference between baking powder and baking soda. 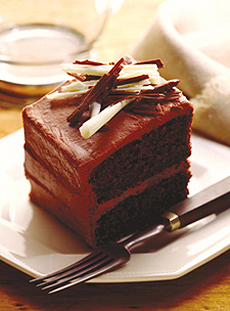 Chocolate layer cake represents the category of butter cakes. This one also represents cake mixes—here, from The King’s Cupboard, a NIBBLE Top Pick Of The Week. Probably second in fame in Austria to the Sacher torte, the Linzer torte, traced back to 1696 in the town of Linz, Austria, is actually a pie with a lattice crust top, not a cake. It is made with an almond short-crust pastry and traditionally filled with black currant preserves (some sources say red currant). In the U.S., where currant preserves are not easy to find, raspberry jam is usually substituted. Today, there are many varieties on the theme: apricot and cranberry, fig and orange Linzers, and hazelnut crusts, which many bakers feel improve upon the original. 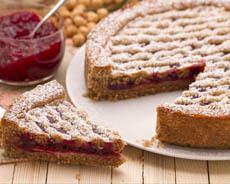 Linzers are also made in tart form and as sandwich cookies, typically with a heart cut out of the top to show the jam. 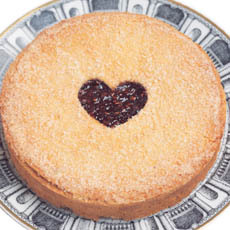 Often made with a lattice top, the heart is taken from linzer cookies. Top photo GianoZefferano.it; bottom photo BurdickChocolate.com. A cake baked in a bread-shaped loaf pan, which enables easy, rectangular slices. These cakes can be frosted like the pound cake at the right, but they are often served plain or dusted with confectioner’s sugar. Carrot cake, ginger cake, marble cake, pound cake, banana bread and zucchini bread are examples. Bread, cakeand loaf are interchangeable terms. 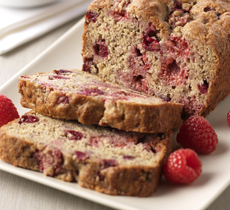 Raspberry crawnberry banana bread. Photo courtesy Driscoll’s. Here’s the recipe. A favorite tea cake, this small buttery cake, with a distinctive shell shape, originated in Commercy, a commune in northeastern France. The name has religious significance: Madeleine is the French name for the Magdalen (Mary Magdalen), and Commercy once had a convent dedicated to her. It may be that the recipe originated with the nuns, as nuns traditionally raised money by baking and selling sweets. Many people liken the madeleine to pound cake, although it is actually a sponge. Some recipes include ground almonds, some have lemon or orange flower water flavoring. They are easy to bake, requiring only a special madeleine pan with its shell shaped depressions. In miniature form, they are often found on a petit fours plate (petit fours sec). Madeleines. Photo courtesy California Milk Advisory Board. Many people liken the madeleine to pound cake, although it is actually a sponge. (It’s listed as a cookie because it’s finger food.) Some recipes include ground almonds, some have lemon or orange flower water flavoring. 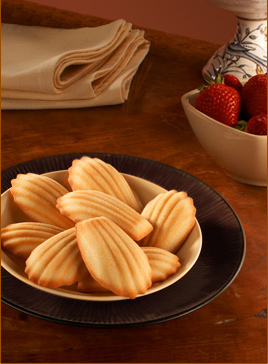 They are easy to bake, requiring only a special madeleine pan with its shell shaped depressions. In miniature form, they are often found on a petit fours plate (petit fours sec). Some stories give credit for the madeleine to Jean Avice, a patissier with the famous M. Bailly in Paris at the beginning off the 19th century, and later chef to Talleyrand. The great French chef Marie-Antoine Carême was trained by Avice, and later called Avice the “master of choux pastry.” Avice is said in some stories to have been the creator of the Madeleine when he had the idea of baking pound cake mixture in aspic molds. However, most authorities believe the madeleine is much older than 1800, so the credit goes back to the good sisters. A plain loaf cake that was popularly served with Madeira wine in the 19th century; today it is served with tea. Madeira wine can be added to the cake batter. The top is often sprinkled with confectioner’s sugar, and garnished with whipped cream. 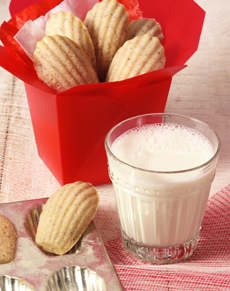 Madeleines. Photo courtesy of Donsuemor. Read our review of Donsuemor madeleines. A vanilla génoise layered with raspberry mousse and fresh raspberries, and iced with white chocolate. Often found as a chocolate-iced loaf cake, marble cake is made by swirling yellow and chocolate butter cake batters together to create a marbled effect (photo at right). It originated in the U.S. or Canada around 1870. 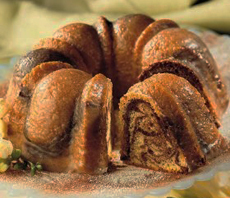 Marble cake made in a bundt pan. Photo courtesy Mrs. Beasley’s. 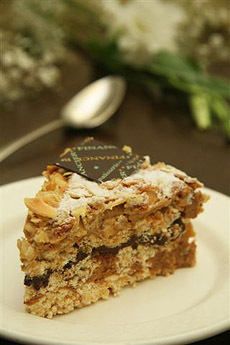 A marjolaine is a praline or mocha dacquoise: layers of almond and/or hazelnut meringue filled with mocha) whipped cream or buttercream. Coffee buttercream and chocolate ganache are another interpretation of the cake, which is then covered in toasted almonds. This multi-layered nut meringue confection was created by the great chef Ferdinand Point, considered to be the father of modern French cuisine. He served it at his renowned restaurant, La Pyramide, in Vienne, a city on the Rhone River in southeast France, outside of Lyon. The restaurant was considered the finest in France from the end of World War I up through Point’s death in 1955. While the recipe is often found in a circular form today, originally Marjolaine was a long rectangle (pavé, or “brick” in French) and considered a pastry rather than a cake. Meringue lovers should pick a Marjolaine. Photo courtesy Financier Pastries.com. The original was a seven-layer brick: four layers of a nutted meringue layered with three different fillings: praline buttercream, vanilla or vanilla-rum buttercream and chocolate buttercream. For decor, Point stenciled his pyramid logo in sugar on top of the cake. While “marjolaine” is French for sweet marjoram, the dessert was named for a lady friend of Point’s. According to FoodTimeline.org, “Mary Ann” was a popular American brand of measuring cups and cake pans in the first half of the 20th century, by the predecessor of Ekco Products. The cake pans were round sponge cake molds with a top indentation to conveniently hold a generous ring of sweet filling or fresh fruit. The style is still popular, although Ekco no loner makes them and other manufacturers can’t use the “Mary Ann” brand name. Wilton calls its model the Fanci-Fill Cake Pan; Norpro calls it a Fluted Round Tart Cake Pan. The fancy version in the photo adds miniature fruits baked into the mold, which can be surrounded by jam or mounded with fresh fruits, whipped cream, mousse, etc. 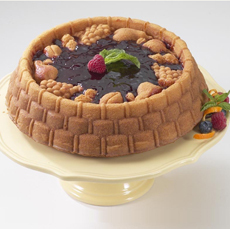 A fancy Marianne cake pan from Wilton has a basket-weave edge and a recessed top that automatically bakes the miniature foods. Photo courtesy Wilton. Marzipan originated in Asia 1,000 years ago and is believed to have reached Europe via Spain, brought by Arabs. A paste of sugar and ground almonds, it grew quickly in popularity with royalty and the wealthy; it was only at the beginning of the 19th century that sugar became affordable and more people could enjoy marzipan (as well as other sweet treats). Read this discussion on the etymology of the name. Marzipan is used as a pastry filling and was traditionally popular in wedding cakes as a layer on top of the cake and under the fondant. Marzipan is sweeter than almond paste; it has more sugar and can be eaten directly as a confection, while almond paste is not be eaten directly but is used as an ingredient. While European countries regulate the ratios of sugar:almonds that define marzipan and almond paste, these do not exist in the U.S. Because the ratios can vary significantly, try different brands to see what you like. Pistachio Marzipan has 4% to 8% ground pistachios, and is the form most often used in filled chocolates. See also persipan. 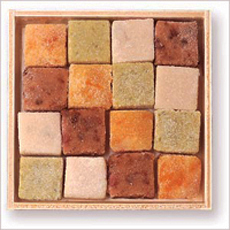 Beautiful handmade marzipan squares from Burdick Chocolate. Photo courtesy Burdick Chocolate. A mixture of egg whites, sugar and cream of tartar, baked in a slow oven. Hard meringue is baked into crisp, white shapes such as drop cookies; cake layers; cups that hold mousse, custard, fruit and other ingredients; rings; and other forms. Soft meringue is browned and used as a topping for desserts such as lemon meringue pie and Baked Alaska. There are numerous cakes made of layers of meringue, or circles of meringue, filled with mousse, custard, crème Chantilly (whipped cream) and/or fruit (see Pavlova). These can be considered a type of flourless cake. This meringue cake is filled with lemon butter cream. The recipe is available from the American Egg Board, aeb.org. These are not cakes but cookies: round balls of shortbread dusted in confectioner’s sugar. 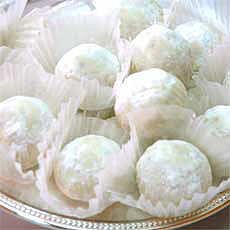 In the U.S., they are often called butter balls and made with finely-chopped nuts. The name “wedding cake” comes from the fact that the dusted-white cookies were traditionally served at weddings. These Mexican Wedding Cakes are available from Filgifts.com. This classic French cake requires no oven: It is composed of layers of crêpes made on the stove top. More than 20 cream-filled layers—not quite 1,000 (mille)—go into each cake. 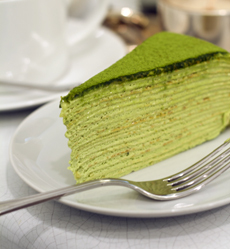 The layers are filled with vanilla pastry cream or flavored pastry cream (chocolate, matcha, etc.). Here’s a recipe. 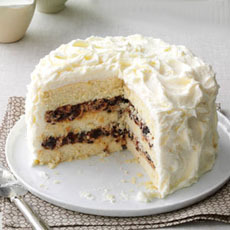 Also see the many-layered Smith Island Cake and Thousand Layer Cake (also called Twelve Layer Cake). Molten chocolate cake is a cross between an individual soufflé and flourless chocolatecake. It is cakey, yet has some airiness. 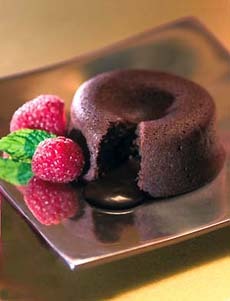 When cut into, molten chocolate flows out (also referred to as the chocolate “lava” of the chocolate lava cake. The molten chocolate comes from not baking the cake all the way through, similar to a runny soufflé. The cakes are usually served with whipped cream and garnished with raspberries and mint leaves; some people prefer a side of ice cream. The cake has numerous other names, including chocolate decadence cake, falling chocolate cake, melting chocolate cake, molten lava cake, volcano cake and warm melting chocolate cake. New York chef Jean-Georges Vongerichten claims to have invented the cake in New York City in 1987, although New York chocolatier Jacques Torres claims that such a dish already existed in France (spontaneous generation is possible). An excellent cake mix is available from The King’s Cupboard, which produces the molten chocolate cake shown in the photo above. Molten chocolate cake available from MackenzieLtd.com. 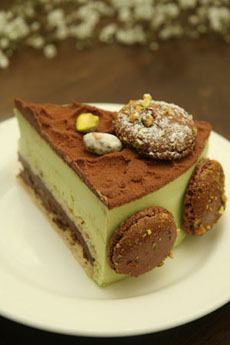 A mousse cake consists of layers of mousse sandwiched with butter cake, sponge cake, biscuit, macaroon or meringue layers. The cake at the left consists of one layer of bittersweet chocolate mousse, one layer of milk chocolate mousse and three thin layers of chocolate butter cake, topped with a white chocolate ganache. Buttercream that has been lightened with Italian meringue or crème pâtissière, used to fill cakes and pastries. Pistachio mousse cake from FinancierPastries.com. The cake, called Adrienne, has a layer of chocolate ganache and almond macaroon biscuit layers instead of traditional cake. Chocolate macaroons are used as decor.